The Scotch is back! This time in the standard portable 330ml bottle and let me tell you that there was definitely something wrong with either me or the other bottle during the first instance of trying this beer (see below.) Personally, I believe it was the bottle or batch for this fresh trial didn’t have any musty, chemical, or whatever is flavor that is often associated with huge corporate brews. No, the bottle I indulged myself with was rather rich and flavorful. The richness was quite surprising for a beer that only has 6% alcohol. Dark amber-orange color. Fruity butterscotch aroma. Malty bittersweet flavor. I wouldn’t call this my favorite out of the Antares line but definitely near the top. After a 3 month (I think) hiatus, Antares decided it was time to head back down south. This time Kolsch and Porter brought along their brother Scotch Ale, which is what I really wanted to try when they first appeared here. In larger 660ml bottles too! Well, I have tried it and let me say that I was extremely displeased with the crap that swirled around my mouth and shot down the ‘ol internal feeding tube. Something wasn’t right. 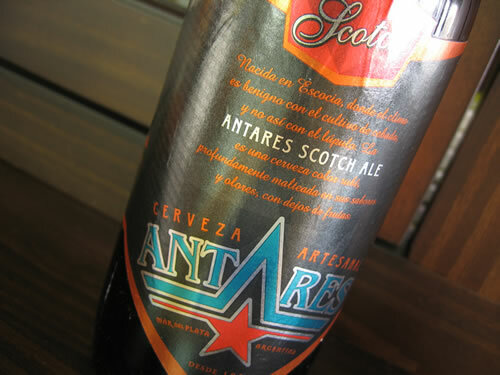 I don’t know if the beer was exposed and re-exposed to extreme temperatures, the larger bottle had something to do with it, bad batch, or if Antares is becoming too “commercial” but something wasn’t right. Maybe constant exposure to Beagle’s awesomeness has tainted my taste buds, but Scotch Ale just tasted plain and bad. A couple notches higher than Quilmes Bock and I’m not going to go there. Although Kolsch is kind of weak, there are still great flavors lying around in the background and I love the Porter. Both of them have a craft beer taste but this Scotch Ale appears to have big-time brewery flavor written all over it. I say “appears” because I’m not giving up hope just yet. In case there was a problem with the batch or shipment, I will try again and again.